The brain tends to remember what it hears at least as well as what it reads. Put your time to good use with our Canada Ham Radio Test Audio series, a set of audio presentations, available in downloadable mp3 format that, will help you prepare for your next Canada Ham Radio written exam. They are a perfect complement to our Five By Canada Ham Radio test preparation software. Our audio presentations are continuously updated just as our Five by Five software's question banks are. So, you can be assured of getting up to date, actual Canada Ham Radio content to study from. The number of questions included, and, hence, the length of the audio presentation varies from test to test, but most tests feature hundreds of questions. The audio portion is generally equivalent to several CDs. Please see the [Buy Now] page for pricing information. No waiting! Download the audio presentation from our website and be listening in just moments from now. A perfect companion to our Five by Five Canada Ham Radio written test preparation software. Q. I don't understand - will I get a CD mailed to me? No. There will be no CD or anything physical mailed to your postal address. Rather, Five by Five Audio is a series of mp3 files that you can download from our website. Q. Can you make me a CD? Unfortunately, we are not in a position to do this. However, almost all PCs have CD-burners (CD-writers) built-in these days. So, if you want to make CDs so that you can, for example, listen to in the car, it should be a relatively simple matter of buying some blank CD-Rs and burning the mp3s to CD. Most CD-writing software will gladly turn mp3s into audio tracks so that you can make an audio CD. This do-it-yourself way is faster and cheaper for you. Q. Does Five by Five Audio include ALL of the questions for a given test? No, and for good reason. While for most tests, most of the questions are covered, certain types of questions are not included. Specifically, questions that have a large visual or calculative element are not included. For example, questions that refer to charts, schematics, and figures (that can not be easily described in the audio) are not included. 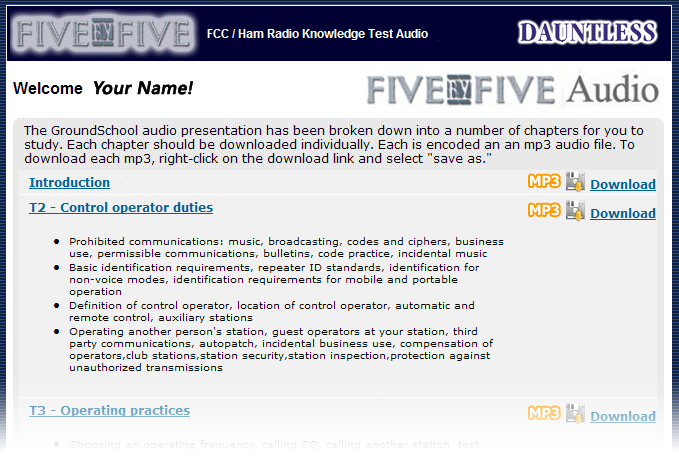 However, Five by Five Audio is incredibly helpful when it comes to, for example, learning questions that pertain to regulations, theory, operations, and similar topics that make up the bulk of most Canada Ham Radio tests. Because Five by Five Audio does not contain all of the questions, we suggest that you use it as a companion to our Five by Five software, which does contains all of the questions, features charts and figures, and has more detailed explanations. Q. Why does the demo play every question twice? This is one of the really, really cool features of Five by Five Audio. When you go to download your mp3s, you can customize the output to best suit your learning style. For example, you can choose to have each question repeat 0, 1, or 2 times (some people like this because repetition helps the brain remember better), and you can also adjust the interval between questions (some people like longer intervals to give the material a few moments to 'sink in' - others prefer shorter ones to get to the next question quickly.) For the demo, we chose to play each question twice and leave a 1 second gap in between each question. Registered users are, of course, able to change their settings and experiment until they find one that works for them. Unfortunately, the temptation to pirate copyrighted audio materials is very strong. The reality is that piracy hurts small, honest companies like ours. In order to prevent this and to maintain value for our honest customers, we have taken some precautionary measures. Specifically, each audio presentation is dynamically created for each user. As part of this process, we also embed hundreds of very subtle "fingerprints" into the audio that you download. If you're a normal, honest user, you will be completely unaware of this tagging. However, if we find that our audio is being illegally "shared" or pirated, our system will be able to very quickly use these fingerprints to identify the source of the pirated copy, which can lead to very serious repercussions for the original owner. The fingerprinting that we have implemented will remain in place regardless of any attempts to change file formats, copy to audio CD, and so forth. Look, we offer a great product quite inexpensively (competing audio CDs generally start at at least twice our price) and do so under a generous license: the download is in DRM-free mp3 format and we allow you within reason to space shift it to CD, your personal digital audio device (such as iPod) and so forth. Please respect our work by not pirating it, even casually "among friends." Understand that while our honest customers have absolutely nothing whatsoever to fear, we will take a zero tolerance approach with copyright infringers. If you have a friend or colleague who could benefit from our products, please direct them to our website where they may purchase their own copies. Thank you for your understanding. Q. Is the content up-to-date? as written above, the audio content is dynamically created for you at the time you download it. This means that yes, the content is generally very up to date with the latest Canada Ham Radio changes, and almost certainly more up to date than DVD and CD programs from competitors. However, if there are to be exceptions to this, they will be noted in the sales / downloads pages so that you are well aware of the situation before purchase. If you are studying in the days and weekd immediately following your purchase of Five by Five Audio, you should be fine as the content is designed to be up to date at the time we sell it. Q. For which Canada Ham Radio written tests is Five by Five Audio available? 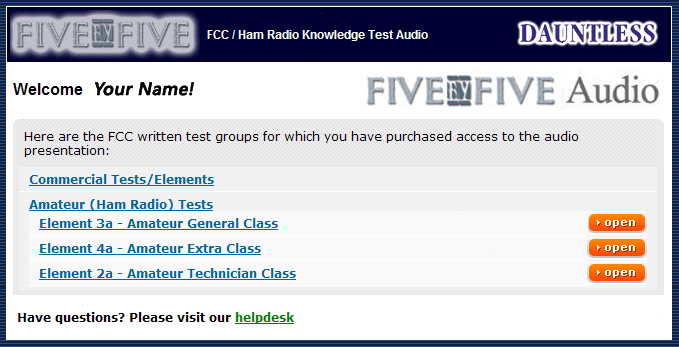 Five by Five Audio is now available for both the Canada Ham Basic and Advanced tests which are covered by our Five by Five (Canada Ham) PC software. Q. What is the purchase process? Select the test group of your choice, read and agree to the terms and conditions as provided, and enter information about your ownership of the Five by Five software (if applicable). Q. What happens after I log in? Q. How do I transfer this to my iPod or other personal digital device? The price depends on a few things, including whether you buy just the Amateur or just the Commercial tests or both and whether you are an existing user of the PC software. To see the price that will apply to you, please click on the "buy now" links on this page and read the information provided in the purchae page. You will find that the price is very reaonable. Please keep in mind that Five by Five Audio generally has the equivalent of 3-8 audio CDs of content per test group. Similar CD-based tutorials from other providers generally range from $60 to $200 and that our price is considerably less than this. Q. What is the price in my local currency? Q. Can I order by Phone, Cheque, PayPal, shiny glass beads, etc? Thank you for trying Five by Five Audio!